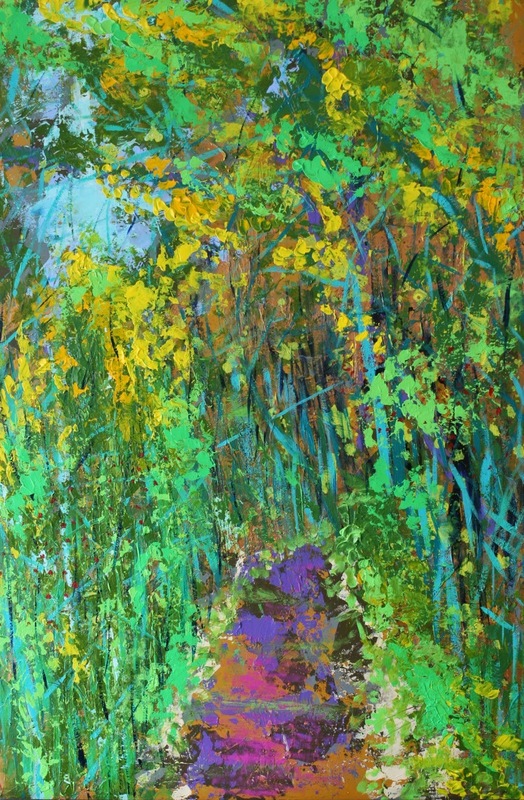 Natasa Vretenar, "Ravine", acrylic, 36" x 24"
Vretenar describes her process: Playing with light is my lifelong passion, both as an Optical Engineer and as an artist. I grew up in the former Yugoslavia, where seed for this passion was planted. I came to live in the Southwest USA in high school, and I fell deeply in love with Wild West, wide-open spaces, and amazing colors of the Western North America. I worked as a scientist for 20 years before moving to Edmonton, Alberta in 2012. Since moving to Canada, I pursue my passion for painting full time. I am an avid traveler and nature enthusiast. Instead of realistically portraying landscapes, flora and fauna, I try to capture emotion related to experiencing nature. I strive to achieve this by applying thick texture to my canvases, playing with light by using dozens of acrylic paint glazes, metallic paints, bright colors and different acrylic mediums. My paintings are 3D expressions of dramatic layers of paint applied by palette knives, and completed with intricate brushwork to create additional depth. Finding joyful things all around me throughout the year in every season, is a journey that brings happiness not only to me, but also to those who take time to explore my finished works of art.